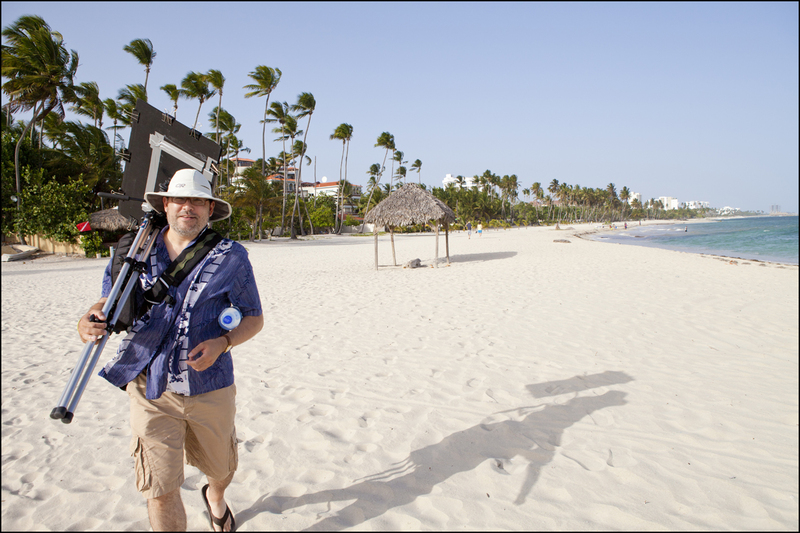 It’s last minute packing time before the Urban Sketchers symposium in Brazil. I’ve been waffling back and forth over what to bring. There was a time I was willing to carry the kitchen sink, but these days my 40 year old neck is telling me to pack light. Experience from last year in Barcelona suggests being attentive to ‘bag security’ while in Brazil. There were a number incidents of theft from distracted sketchers. Mostly phones and tablets. This is easy enough to avoid. Just don’t bring those items. But, in any crowded city, my general policy is: never put your bag down, never spread your stuff out, be able to walk away at any time. This is not just paranoia, it’s handy for staying out of the way of traffic, avoiding panhandlers, dodging police, etc. So, here’s what I’ve settled on. The plan requires two bags actually. Go Bag Watercolor! 14 Liter 34x26x14cm Cocotte FRED. Loaded weight 11lbs. CONTENTS: A: Sirui tripod, B: Eric Michaels tripod accessory tray, C: 6 – 11×14” Coroplast drawing boards (thus, 12 sheets of paper – more than enough for a day – typical over-packing! 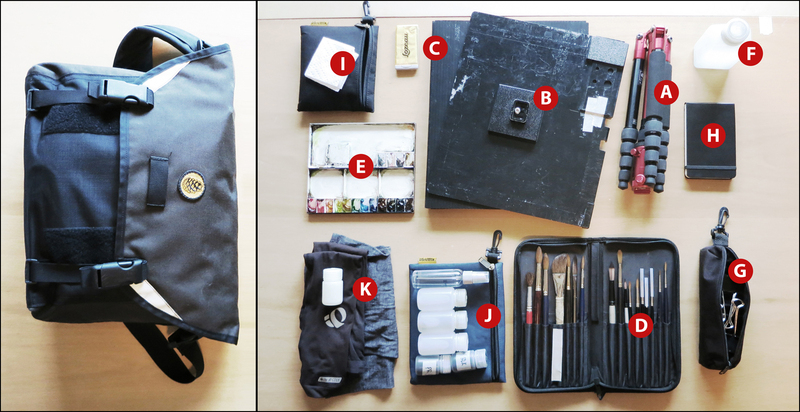 ), D: brush case full of too many brushes (I will probably only use the #10 round), E: Holbein 12 slot tin palette, F: 250 ml Nalgene water jar (optionally x2 – will see if I need more), G: bag of bulldog clips for dogging down boards, H: Moleskine mini-sketchbook (removed) I: pouch with paper towels, eyeglass cleaner, J: pouch with black and sepia washable ink (removed), 60ml water bottle for ‘kung fu grip’ and misting bottle. K: sun screen, sun sleeves and scarf (yes, I’m over doing the sun safety – but now that I’m outdoors ‘full time’, better safe than sorry). There’s even space remaining for a water bottle. You’ll note the absence of any drawing supplies. This my minimum kit for watercolor. If I bring pens, I’m going to end up drawing :) I just like drawing too much. But mainly I want to be able to grab the bag and go, knowing I’m set up for watercolor. This is the way my creativity works: I set up a project for the day, and do ONLY that. Otherwise I’d be bouncing around and never finish anything. Go Bag Sketching! 6 Liter 27x19x12cm Cocotte FRIDA. Loaded weight 4.6lbs. CONTENTS: A: Hand Book 8×8” watercolor sketchbook and coroplast backing boards. B: pouch with tin boxes of (way too many!) pen cartridges and pencil leads (what is wrong with me? it’s not like I’m going to run out this many times! Security blanket behavior! ), black and white gouache, kneaded eraser, C: mini-kit of W&N half-pan watercolors and #10 DaVinci sable travel brush (don’t know what I’ll do if this wears out/gets lost – I bought it back when I had a job! ), D: pencil box with Lamy Safari fountain pen, 0.7mm pencil, Kuretake #13 brush pen, E: Tachikawa nib holder and various nibs, F: Pouch with 30ml bottles of black and sepia (washable) ink, 60ml water bottles, sun screen, sun sleeves and scarf. G: That’s not really there. Combined with H.
If I can manage it, (convenience/willpower) I might do all my drawing with the dip nibs, allowing me to ditch all those pen cartridges. That would be nice. I could lose all the tin boxes and probably save half a pound. Have a wonderful time in Brazil! Can’t wait to hear all about it! By the time you get back it should be time to do some fall colours on the mountain. Looks like a well thought out kit. One suggestion as I have travelled monthly to china for my job for the last six years. My kit is similar to yours except I lost the Nalgene bottle years ago. I simply buy bottled water in large bottles where ever I find myself. You don’t think it will take up much room…..but when you are traveling, less is more. Thanks, I really, really enjoy your posts and helpful tips and techniques. You are HILARIOUS!!! Such a human being — I particularly love the “what’s wrong with me?” comment… again hilarious. I just joined your site, blog, whatever this is and I can’t get a handle on how all this started? I have been sketching everyplace all my life (and I am paleolithic), so when did this start to have groups meeting in different parts of the planet? Apparently no concern about taking ink bottles or Lami pen on the airplane or through security? It seems to be fine, I just bring them in a ziplock as per the under 2oz liquid handling instructions. New to US and your work is inspiring me in my search to findi a direction. Clicked on a post from 11/12/2013 in which you demonstrated sketching with A washable ink. Question: was all of the toning done with ink pulled from the lines or did you brush diluted ink onto the sketch. If done with the sketch line, how do you keep the original edge from melting. Am I just using the wrong ink? Well, you ca do it both ways. The amount of ink that bleeds depends on how much water, the kind of paper and how aggressively you brush. I recommend a Lamy fountain one with their Lamy brand ink, and using a smooth sketchbook paper. It will take some messing around to get the ideal effect :) You have to be selective which lines you touch, and which you blend. where do you get the metal pencil tins/boxes? You tend to find these sort of things in high end stationery stores – even though they are just cheap little things. (They get dented up immediately). I got some in Japan town in San Francisco at at Kinokuniya stationer. (Not the book store – they have a paper and pens store as well). And of course I see them on Amazon – (just search for Tin Containers or some such). Great you asked that, now I know where to find a wide variety when I make some mini watercolor kits! – Actually I just searched tin container / tin box on Ebay and find even more variety!